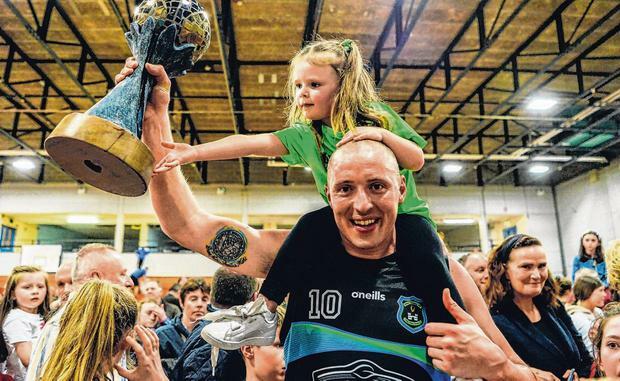 Kieran Donaghy returned silverware to the Kingdom once more, inspiring Garvey's Tralee Warriors to Super League glory last night in his side's 88-73 victory over UCD Marian at Tralee's Sports Complex. The former Kerry footballer hit 16 points in yesterday's victory, their second over the Dubliners in 24 hours, having triumphed 89-84 in over-time at UCD's Sports Centre to set up their path to glory. Orginally one of the games had been set for December before a clash with Ireland U-16's schedule forced Tralee head coach Pat Price, who is also boss for the underage side, to request the match be refixed. In Saturday's game, the Kerry men had to fight back from ten points down before levelling the contest at 80-80 before securing victory in the extra period. Yesterday, Donaghy laid the foundations for victory with a massive first-half performance and was ably assisted by Keith Jumper (who led the scoring, shooting 20 points) and Fergal O'Sullivan to see their side into a 55-35 half-time lead. After the break, Warriors had to hold off a late UCD comeback, led by American Elijah Mays, to secure glory. Underage player and local hero Rapolas Buivydas, as well as superb work by Eoin Quigley, ensured this title was going nowhere else but the kingdom. "This kind of thing doesn't happen by accident," Price said. "I'm delighted for them, they've earned it and that's how it should happen - you should earn it. "UCD were defending champions and they weren't going to roll over." Tralee's victory killed Templeogue's hopes of securing a play-off for the spoils, with the Dubliners beating Moycullen 105-79 in NUIG on Saturday. The Dubliners led by 40-64 at half-time before Dee Proby, Lorcan Murphy and Jason Killeen put the result beyond doubt. In the Division 1 final, Stefan Zecevic led the scorers, shooting 29 points, as DBS Éanna beat Dublin Lions 73-67 yesterday.